A 21-year-old female student presented to the emergency department with acute pleuritic chest pain and shortness of breath while jogging. She reported having been previously prescribed salbutamol for mild asthma. Her vital signs were stable. Breath sounds were not audible over her left hemithorax. Chest radiography was performed (figure 1). Which option below best describes the radiological findings of the chest radiography shown in figure 1? Chest radiograph upon presentation to the emergency department. There were signs of tension pneumothorax including mediastinal shift to the right, and depression of the left hemidiaphragm. An intercostal drain was promptly inserted. Repeat radiography showed expansion of the left lower lobe and a persistent absence of lung markings in the left upper lung field (figure 2). Describe the classification of spontaneous pneumothorax. 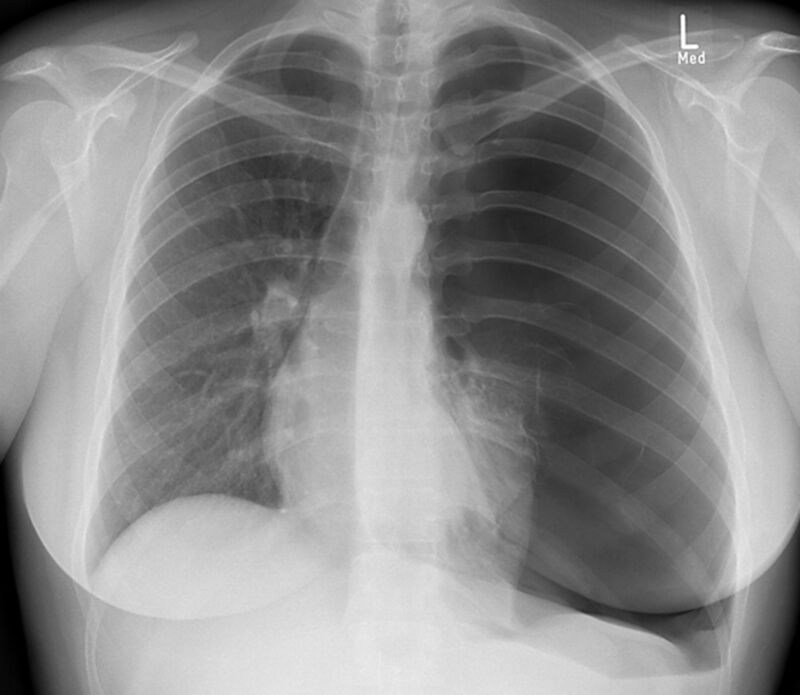 Chest radiography with partial re-expansion of the lung following chest tube insertion. Spontaneous pneumothorax can be classified as primary or secondary. Primary pneumothorax most often occurs in young males with a tall, slim build. Smokers are at a higher risk of developing primary pneumothorax. Secondary pneumothorax is associated with an existing lung disease such as emphysema, pulmonary fibrosis or cystic fibrosis. Pneumothorax may also be iatrogenic, often related to central venous catheters or mechanical ventilation, or caused by trauma. Enhanced computed tomography (CT) of the chest revealed large bullae in the left upper lobe, measuring up to 7×7×8 cm, and a marked paucity of normal pulmonary vasculature on the left, particularly in the upper lobe (figure 3). These findings were consistent with a diagnosis of Swyer–James–MacLeod syndrome. 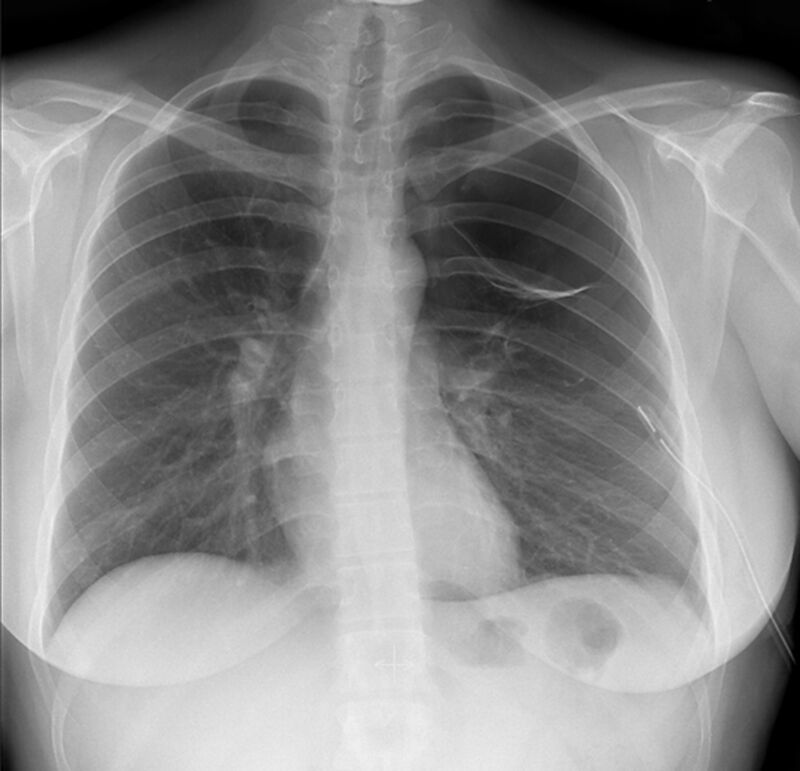 Swyer–James–MacLeod syndrome is typically associated with unilateral hyperlucency of the lung on conventional chest radiography. Describe the further differential diagnosis of unilateral hyperlucency of the lung. a) Coronal reconstruction of chest CT angiography images showing marked hypodensity of the left upper lobe. b) Coronal reconstruction of maximum intensity projection chest CT angiography images showing vascular hypoplasia of the left lung. Unilateral hyperlucency may be caused by either a decrease in the perfusion of one lung or by hyperinflation of one lung. A decrease in the perfusion of existing vascular structures may be caused by pulmonary embolus or compression of a pulmonary artery due to mediastinal tumour mass. Hyperinflation may be caused by central obstruction (foreign body or tumour) resulting in a one-way valve and gas trapping. Emphysema is a common cause of hyperinflation but is generally symmetrical and typically causes hyperlucency of both lungs. Unilateral hyperlucency may be seen in patients with asymmetric distribution of emphysema or in patients following unilateral lung transplantation. Unilateral pneumothorax, characterised by the absence of pulmonary markings, may also result in unilateral hyperlucency. In addition, a normal lung may appear to be hyperlucent if the contralateral lung is abnormally radio-opaque, as in the case for unilateral pulmonary infiltrates, unilateral pleural effusion or asymmetry of the overlying soft tissues (for instance, following unilateral mastectomy or in severe scoliosis). Technical factors, such as rotation of the patient with respect to the radiographic film, may also cause the appearance of unilateral hyperlucency. Lung function testing showed hyperinflation and a smaller total lung capacity as measured by helium dilution (4.82 L) compared to plethysmography (5.84 L), consistent with large bullae. Pulmonary haemodynamics, as assessed by echocardiography, were normal. Serum α1-antitrypsin levels were also normal. Following video-assisted thoracoscopic bullectomy, the patient recovered well. 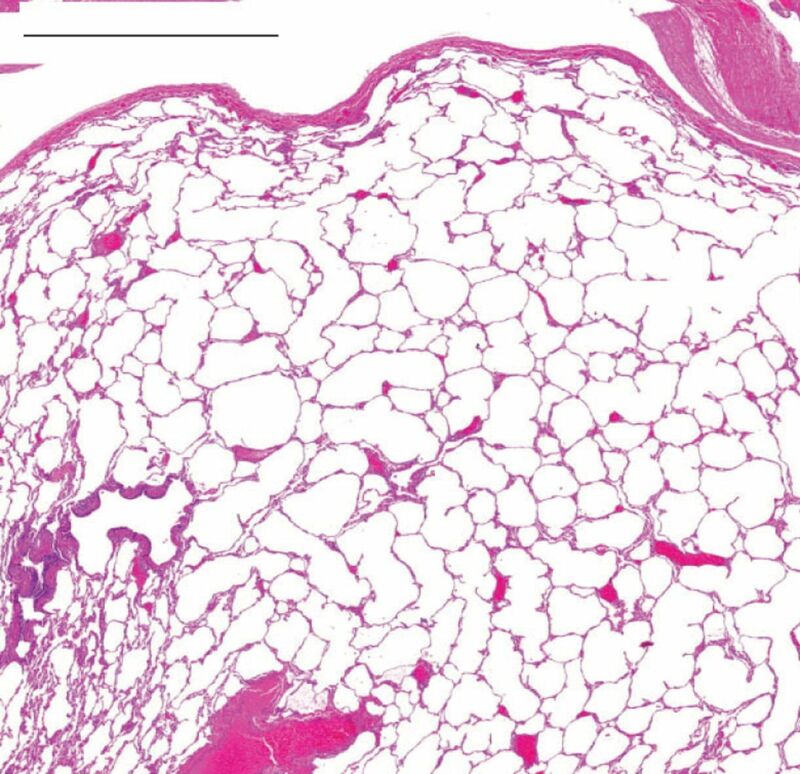 The resected lung tissue showed emphysematous changes and bullae (figure 4). Echocardiography 6 weeks after surgery showed no signs of pulmonary hypertension or right heart strain. Based on the degree of pulmonary vascular ­hypoplasia in our patient, we recommended that she be followed clinically in our pulmonary centre, including yearly echocardiography and lung function testing. Over the past 5 years, the patient has remained well and been able to continue her studies. Pulmonary function and echocardiographic parameters are within normal limits with no sign of pulmonary hypertension and no recurrent pneumothorax. Emphysematous changes with hyperinflation in the resected lung tissue stained with haematoxylin and eosin. Scale bar=2 mm. Swyer–James–MacLeod syndrome, a rare condition characterised by the relative translucency, hypoperfusion and hypoplasia of one lung, was first described by Swyer and James  in 1953 and MacLeod  in 1954. Symptoms are generally nonspecific, including chronic cough and shortness of breath on exertion. The pulmonary hypoperfusion and hypoplasia seen in Swyer–James–MacLeod syndrome [1, 2] are thought to be caused by pulmonary infections early in life ; however, the precise aetiology and factors predisposing to the syndrome’s development are not known. Swyer–James–MacLeod syndrome is often diagnosed in childhood and the long-term clinical course of Swyer–James–MacLeod syndrome in adults has not been well described. There are isolated case reports and small case series describing the diagnosis of Swyer–James–MacLeod syndrome in adults [4–9]. One case series describes the first diagnosis of Swyer–James–MacLeod syndrome in four patients aged 33–51 years . Another case series reports on six patients aged 27–43 years , and another describes two patients aged 68 and 38 years . In all but one case, the diagnosis was preceded by chronic pulmonary symptoms, most commonly shortness of breath and cough. Many of the patients described had chronic sputum production and some had haemoptysis. A prior diagnosis of asthma or COPD was reported by several patients and several patients were found to have airway obstruction during pulmonary function testing. Two patients from these case series were found to have pulmonary hypertension. An additional two cases in the published literature describe adult patients with Swyer–James–MacLeod syndrome and pulmonary hypertension, in one case, related to a patent ductus arteriosus , and in the other, presumably related to the pulmonary and vascular manifestations of Swyer–James–MacLeod syndrome . Although our patient has no signs or symptoms of pulmonary hypertension, we decided to monitor her with yearly echocardiography. Reports on long-term follow-up and prognosis of Swyer–James–MacLeod syndrome are lacking in the literature; however, one case report describes a normal pregnancy outcome in a patient with the condition . In the case presented here, the diagnosis of Swyer–James–MacLeod syndrome was made following spontaneous pneumothorax with apparent failure of the affected lung to fully re-expand following insertion of a pleural drain. The large bullae in the left upper lobe gave the appearance of incomplete re-expansion of the lung. The CT morphology and pathological findings were consistent with Swyer–James–MacLeod syndrome. In contrast to most of the adult patients described in the ­literature, our patient did not report chronic pulmonary symptoms before diagnosis of Swyer–James–MacLeod syndrome. Swyer–James–MacLeod syndrome should be considered in otherwise healthy patients presenting with unilateral pulmonary hyperlucency. In our patient, the prognosis during 5-year follow up was excellent; however, larger patient cohorts should be studied in order to confirm this finding and establish recommendations for long-term care of this rare condition. Conflict of interest Disclosures can be found alongside the online version of this article at breathe.ersjournals.com.
. A case of unilateral pulmonary emphysema. Thorax 1953; 8: 133–136.
. Abnormal transradiancy of one lung. Thorax 1954; 9: 147–153. Swyer–James (MacLeod’s) syndrome following pertussis infection in an infant. Scand J Infect Dis 2003; 35: 197–199. Adult diagnosis of Swyer–James Macleod syndrome: retrospective analysis of four cases. Respir Care 2014; 59: e51–e54. Six adults with Swyer-James-Macleod Syndrome. Eur Respir J 2013; 42: Suppl. 57, P2265. Adult Swyer–James–Macleod syndrome: report of two cases and review of the literature. Ital J Med 2014; 8: 127–131. Adult diagnosis of Swyer–James–MacLeod syndrome: a case report. J Med Case Reports 2011; 5: 2. Swyer–James–Macleod syndrome presenting with pulmonary hypertension. Iranian Cardiovasc Res J 2010; 4: 134–138. Successful pregnancy outcome in Swyer–James–Macleod syndrome. Ann Thorac Med 2008; 3: 26–27.